The Acquired Brain Injury event held in September was one of HPANT’s most attended for the year with a massive presence of allied health professionals and a good distribution between hospital and community based practice. Attendees were treated to hearing from Dr Jim Huntley a specialist in clinical neuropsychology who discussed the process of assessments for both clinical and non-clinical purposes. This included fantastic insight into the complexity and detail that goes into these assessments and the importance of answering the referral question. Julia Swenson, the principal occupational therapist from Territory Therapy Solutions showcased the variety of areas which need to be considered when working with patients with an ABI and the range of products and solutions which are available to support them in their recovery process and in managing the range of new symptoms and intolerances which they may experience, including the importance of small details such as comfort of clothing down to the abrasiveness of stitching. After a short break to network and recollect props, Jade Phillips a physiotherapist from Territory Therapy Solutions walked us through mobility assessments for patients post ABI and helped explain the difference between presentations and how these are managed. 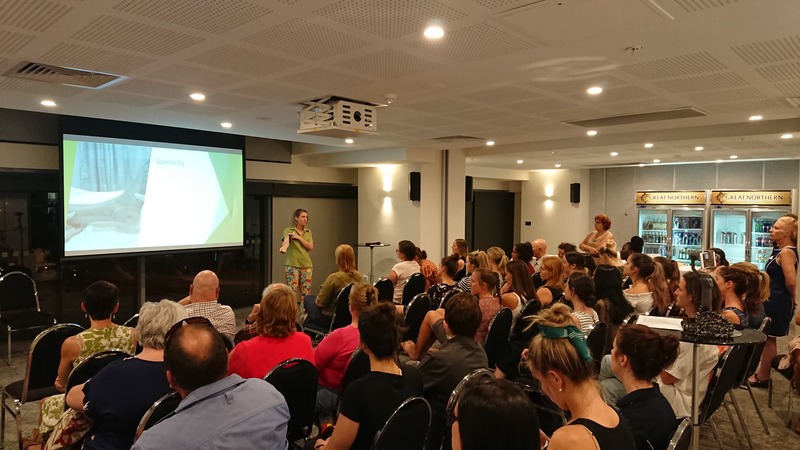 Jade Phillips presenting to NT health professionals - Photo courtesy of Sam Keitaanpaa. Finally, Dr Howard Flavell spoke on post-concussive injury and soon to be announced services in the NT to support people who may be experiencing PCI. The value of having a diverse range of attendees showed with some great discussion between Howard and Jim on how risky even small trauma to the brain can be and answering questions from the audience around differential diagnosis in patients as well as the need for contained discussion in this emerging area.